I won’t be a tease, I’ll get right down to it: Skagway had more bars and brothels during the late 19th/early 20th century Alaskan Gold Rush than Vegas has strip clubs. Most are obviously no longer in operation, however at that time there were over 70 of them (FYI you can walk from one side of downtown to the other in about 10 minutes). 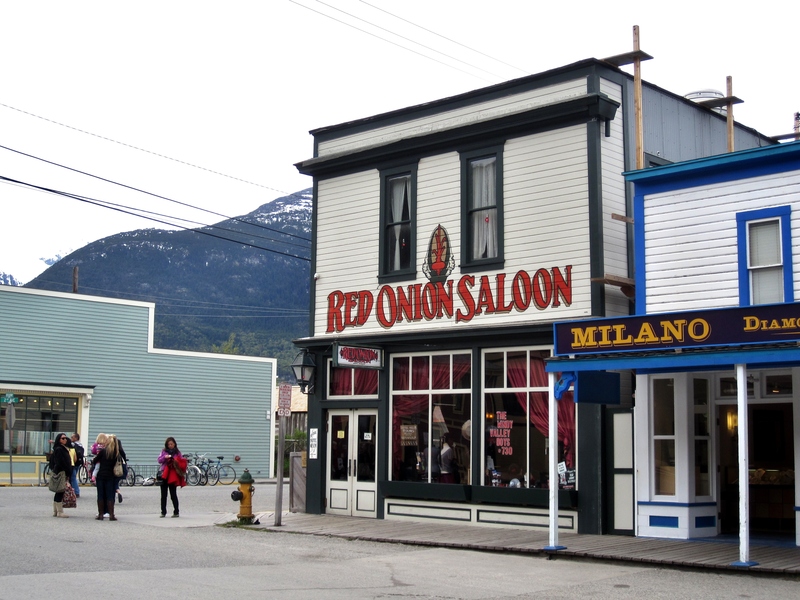 Most famous is the Red Onion Saloon, hard to miss in the center of town. Skagway was a stopover/launching point for men participating in the gold rush, and did they ever need some entertainment (especially after being lied to by journalists re: the feasibility and ease of finding wealth… story to come on what the locals refer to as “Liarsville”). The men would come into the Red Onion and order a shot of whiskey, at which point they would eye the line of dolls on the shelf behind the bar. They were all carved in the image of one of the girls working upstairs, and if the doll was upright she was available. Five dollars worth of gold would buy a man fifteen minutes, so they would often sit and wait until their favorite gal became free. Each room upstairs had a hole in the floor into which the girls would drop the gold piece upon the session’s completion. The hole fed a tube that carried the gold into different chambers behind the bar, and when the bartender heard it coming down he would turn the corresponding girl’s doll upright, signaling she was once again primed for purchase. A little more about Skagway: It’s been 30 years since a baby was born there, there is no doctor in town (only EMTs, nurse practitioners, and physician’s assistants), the closest trauma center is Seattle (1123 miles), the population in January (winter) is around 400 people, and the town was equipped with electricity before New York City. Interesting place, for sure, but it’s not only the history and culture: Nature is what will make your camera smile. Skagway is tucked in a valley amongst the mountains and situated right on the water, very similar to the way Juneau is positioned (you can drive into Skagway, however). 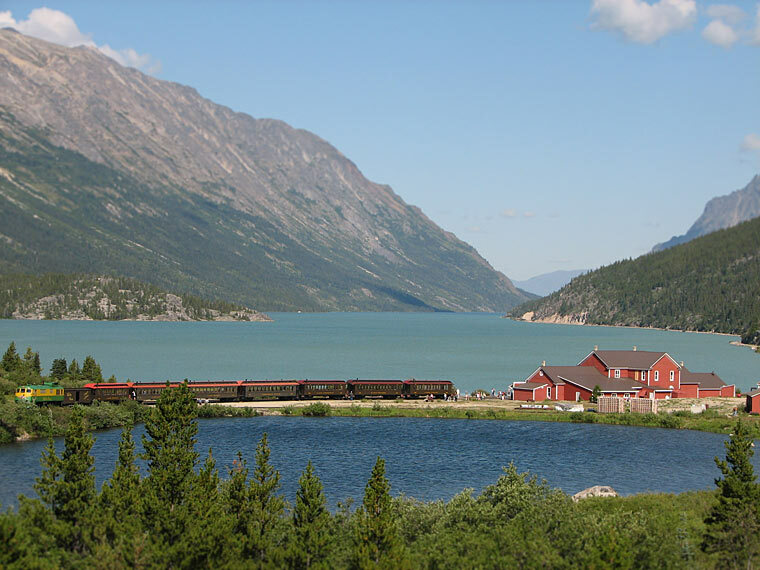 To get the full scope and lay of the land, we traveled by bus up into the mountains to Fraser, British Columbia (about 20 miles), and took the White Pass Yukon Railroad back down to Skagway (there are several different tour options). 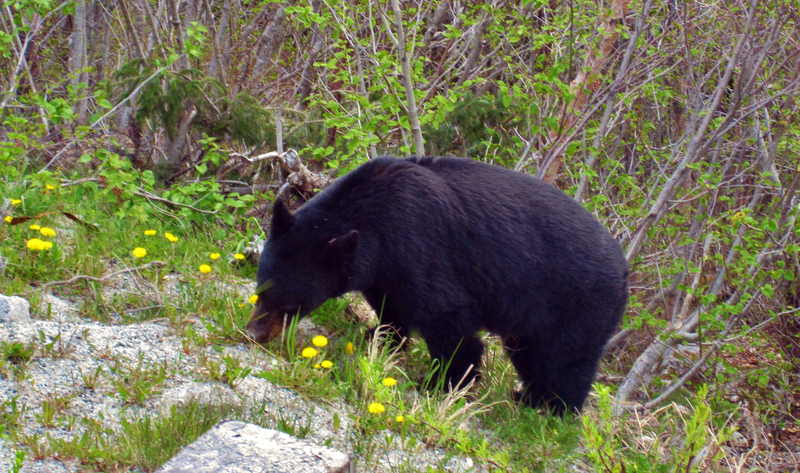 It didn’t take long for us to meet the members of the Alaskan wildlife head on: Twenty minutes into the drive we came across a black bear on the side of the road, munching on dandelions (see photo below). The driver pulled over and we crowded the windows on the curb side, the bear only ten to fifteen feet away, although he hardly acknowledged our presence. He was more concerned with the dandelions, just out of hibernation and apparently very, very hungry. We continued on but that moment stuck with me very clearly throughout the day – how many people get that close to a bear outside of the zoo? 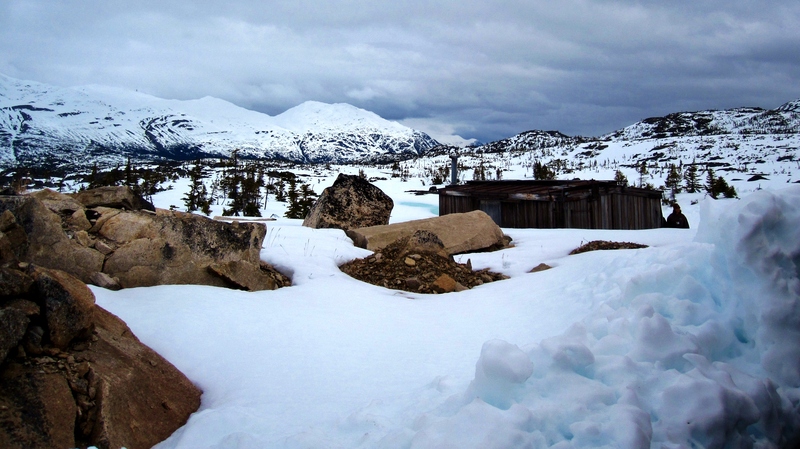 The weather on the coast was mild (50s), but it was almost as if a white sheet had been tossed over the landscape as the train departed Fraser approximately 20 miles inland – snow covered the ground and mountains in all directions, the only variation the stone rocks that jutted out and the small pools of blue glacier water that could be seen on either side of the tracks (see photo on Wake and Wander’s Facebook page). 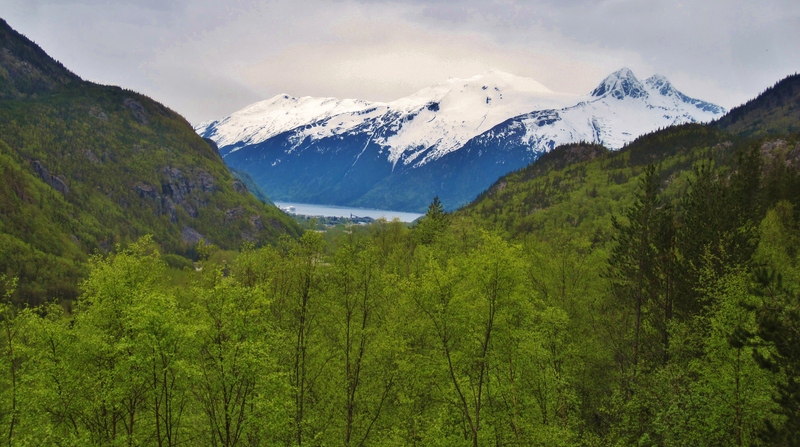 The railroad was built and used during the gold rush to transport men up into the wilderness – a project that solidified Skagway as a major boom town of the Klondike Gold Rush. 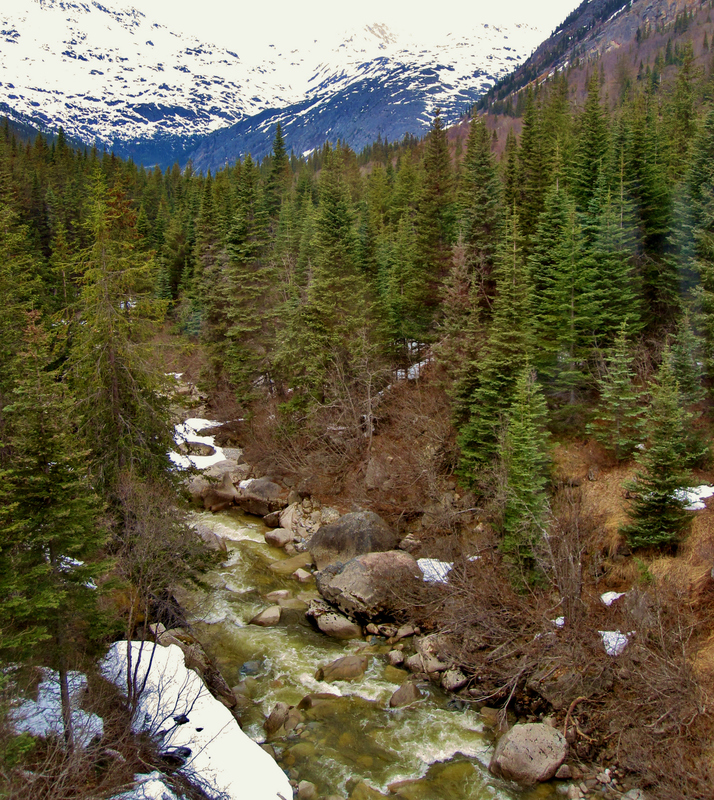 The ride is pleasantly slow and scenic, the snow giving way to lush mountainsides of green trees and cascading waterfalls. There are different shades of green, some bright like spring and others deep and hearty, the latter represented by the winter-tough tall pines. 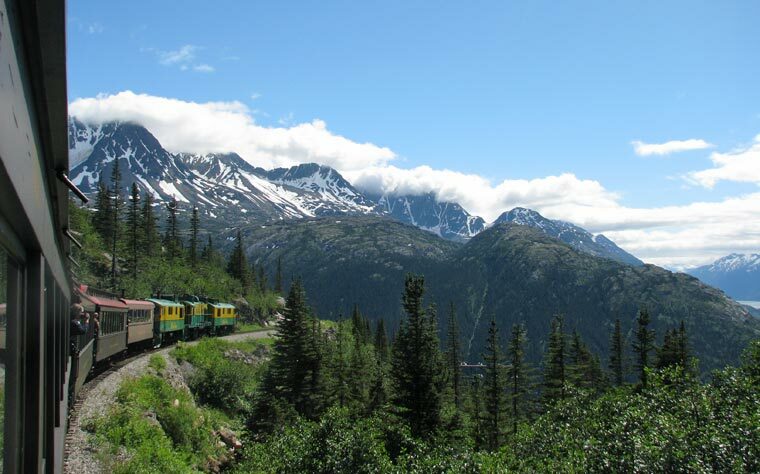 I found the railroad to give a perspective that would typically be associated with a plane or helicopter ride (such as the seaplane ride in Juneau), a broad overview of the land that you simply cannot achieve by a walking or bike tour. 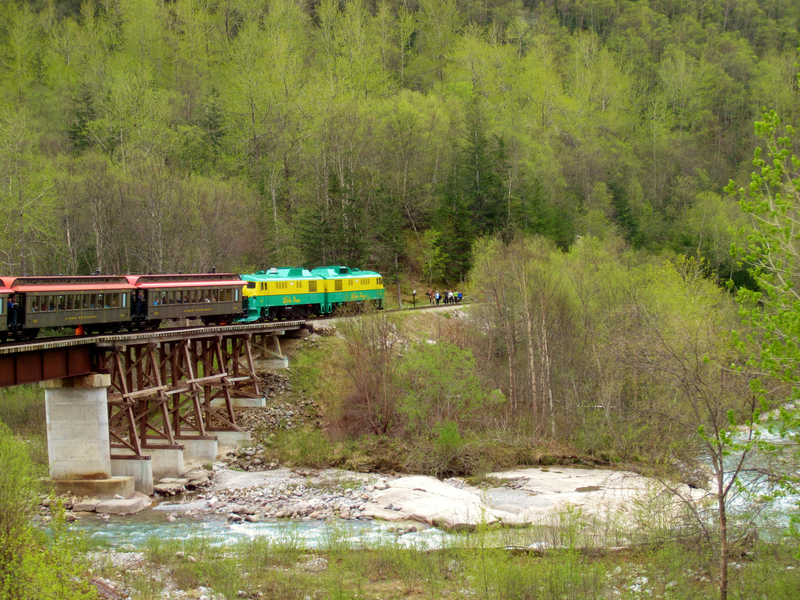 Those excursions are no doubt available for visitors to Skagway, but the advantage one gets on the train lies in the person’s proximity to what they are observing. I wasn’t looking down upon the land, I was immersed in it, looking up at the tops of the pines and rolling through the valleys and over the rivers. I think that’s an important aspect to keep in mind as you mull over the options of exploration. 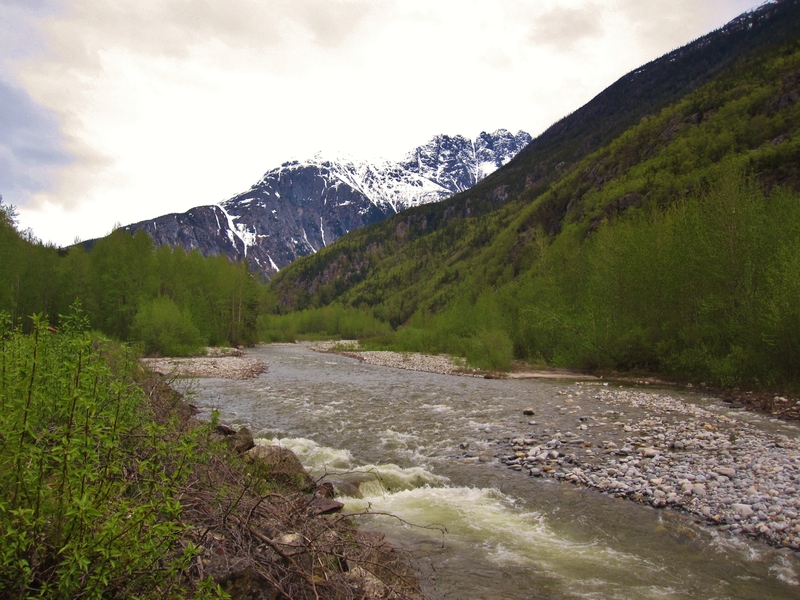 Those on a tighter budget should check out Reid Falls near the Gold Rush Cemetery, a 300-ft waterfall located about two miles from downtown Skagway. The area is known for its abundance of Rhubarb – keep your eye out for a slice of pie. 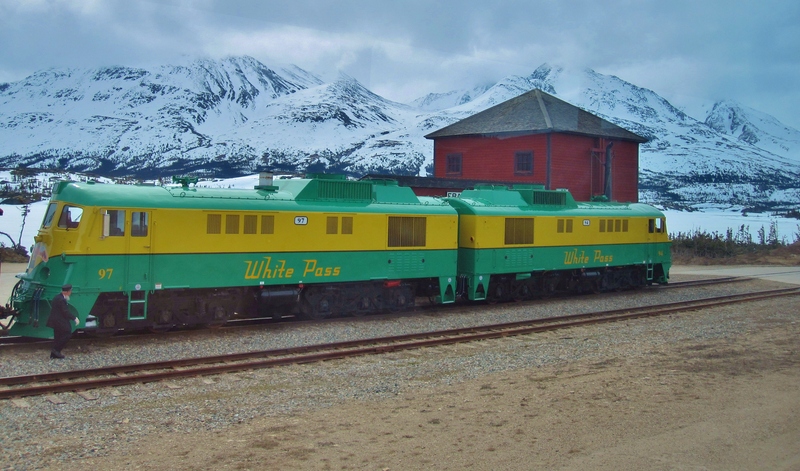 White Pass and Yukon Railroad on a sunny day. Photo courtesy WPYR. 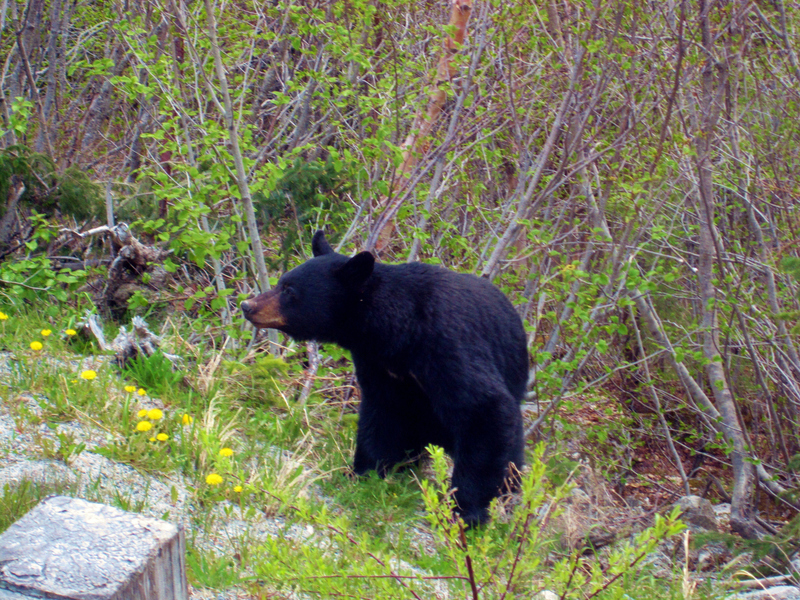 Bear alongside the road in Skagway, Alaska. 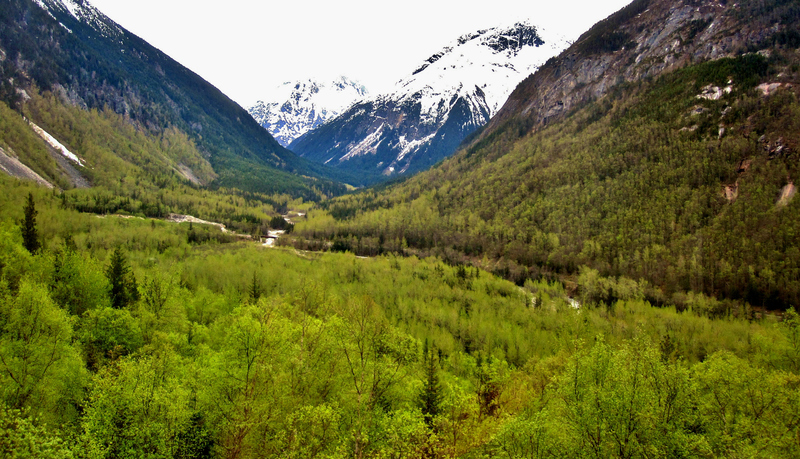 Train ride through Skagway, Alaska. 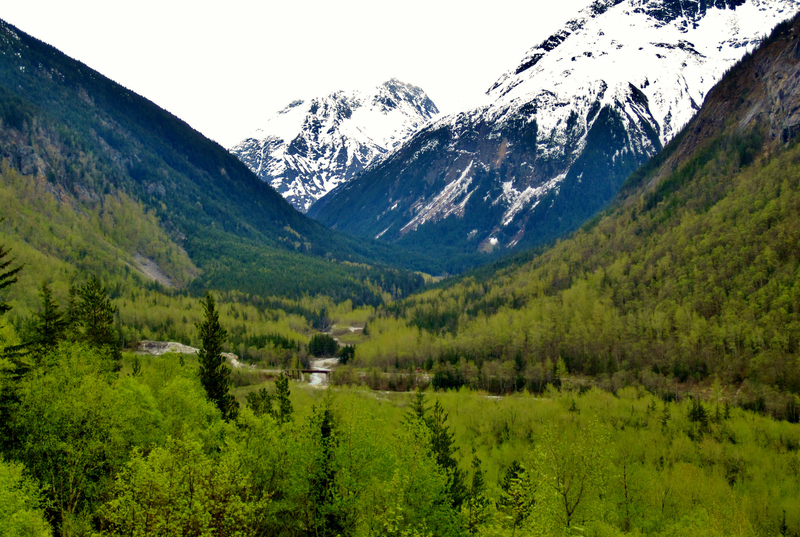 View from the train ride from Fraser, BC, to Skagway, Alaska. Beginning of train ride in Fraser, BC. 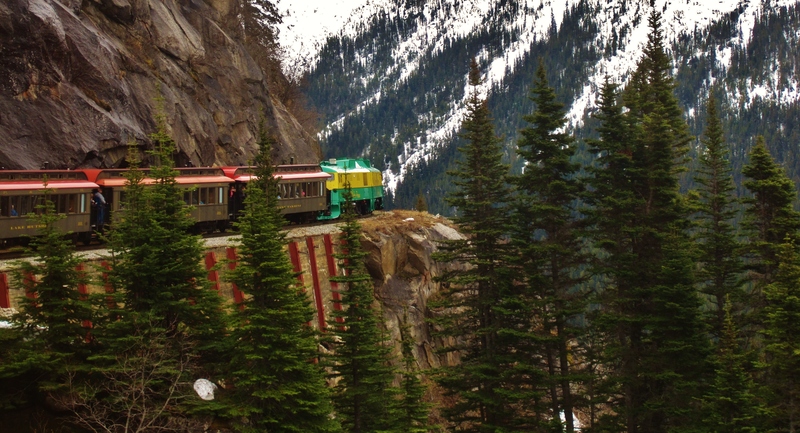 Train rolling through the wilderness near Skagway, Alaska.